Your unwanted glass dishes cannot go in the recycling because they melt at a different temperature than other types of glass. Learn what to do with glassware. Ceramic can’t be melted down at most waste facilities. Recycling facilities that accept brick and concrete will sometimes accept ceramics. Be careful when you dispose of broken dishes, since jagged or sharp edges could injure a sanitation worker. If you can, wrap up the pieces in a cloth and break them down further with a hammer so they won’t hurt anyone. Then, dispose of them as broken glass. Never recycle any broken glass item, even glass bottles or jars. Broken glass can injure trash haulers and sanitation workers. Learn what to do with broken glass. If you have a vintage china set, you can try selling to an organization like the International Association of Dinnerware Matchers or to Replacements, Ltd. The FDA only recently (close to 40 years ago) created regulations for leachable lead in dinnerware. 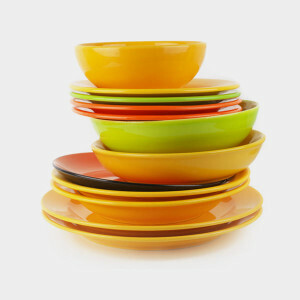 Consequently, some vintage dishes contain dangerous levels of lead, and sometimes even more harmful substances, such as uranium. Experts recommend doing an at-home lead test for your vintage dishes, as well as avoiding heating your dishes, and remaining wary of cracks and fades in ceramic glaze.